Barcelona moved six points clear at the top of La Liga despite being held to a goalless draw at Athletic Bilbao. 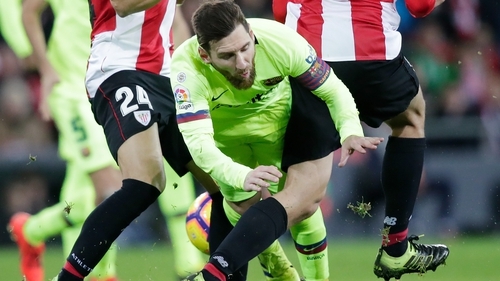 Lionel Messi was back in Barca's starting line-up for the first time following injury, but he could not inspire the visitors as Bilbao made it seven home league matches unbeaten. Barca goalkeeper Marc-Andre Ter Stegen pulled off a superb save to keep out a well-struck drive from Markel Susaeta in the 17th minute. Messi grazed the crossbar with a sublime 30-yard chip in the 26th minute after Nelson Semedo had brought keeper Iago Herrerin out of his goal to block an attempted shot. It would not have counted, however, as Semedo was adjudged to be offside. Mikel San Jose curled a shot just past the upright and Inaki Williams was denied by Ter Stegen as the home side looked the more likely after the break. Bilbao's Oscar De Marcos was sent off for deliberate handball late on but the home side held on. Two last-gasp goals earned 10-man Sevilla an unlikely point in a 2-2 draw at home to Eibar. The visitors were seemingly in control, taking a 2-0 lead through a fine solo effort from winger Fabian Orellana and header from Brazilian Charles. Ever Banega was sent off for a second bookable offence with six minutes remaining, but that sparked Sevilla into life. Wissam Ben Yedder latched on to Pablo Sarabia's through pass to pull a goal back two minutes from time, and Sarabia snatched an equaliser in stoppage time from Quincy Promes' cross. Youssef En-Nesyri scored a hat-trick as Leganes claimed a 3-0 win at home to Real Betis. The Moroccan took his tally to six goals in his last three matches, opening the scoring after 22 minutes from a Jonathan Silva assist and adding a second before half-time with a neat finish from a Oscar Rodriguez pass. En-Nesyri completed his treble in the 66th minute when he was played in by Middlesbrough loanee Martin Braithwaite. Betis had former Manchester City midfielder Javi Garcia sent off late on to complete a miserable afternoon. Valencia played out a goalless draw with Real Sociedad at the Mestalla. Rodrigo came closest for the home side in a match of few clear-cut opportunities, as he fired inches wide in the 70th minute. Substitute Sandro Ramirez, on loan at Sociedad from Everton, almost snatched victory for the visitors but his goal-bound effort was blocked.